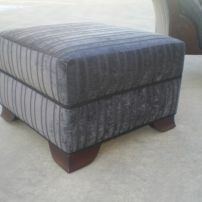 This Genie ottoman is available in a large variety of colours and sizes. 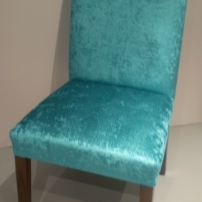 commented on ""SATTEIN" Slim Line, High Back Dining Chair designed by JARO"
Our Sattein can be upholstered in fabric, leather or vinyl - a fabulous range of materials! 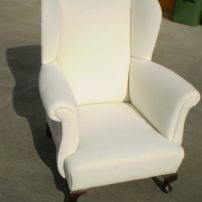 commented on ""SICARA" Occasional Arm Chair"
Looking for an extremely comfortable & versatile chair - the Sicara is it! 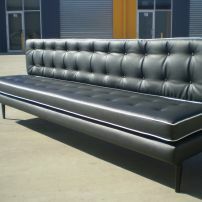 commented on "1950's Sofa Banquette Seating for Melbourne and Gippsland areas." 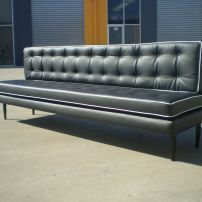 1950's Sofa Banquette Seating for Melbourne and Gippsland areas. 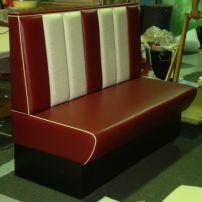 We can custom make 1950 style sofas, chairs, banquettes to suit your requirements. commented on "1950's Sofa or Banquette & Booth Seat, Melbourne"
commented on "1950s Booth & Banquette Seating available in Melbourne"
JARO now has a new range of 1950 booth seating. Available in many colours and vinyl styles. 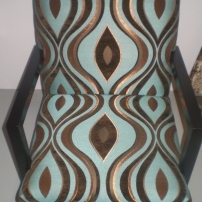 commented on "2 Toned Arm Chair Reupholstery available at JARO Upholstery, Melbourne"
These beauties were reupholstered in a natural flax printed fabric. 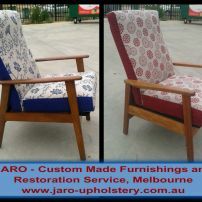 Send through a picture to enquiries@jaro-upholstery.com.au for a free no obligation quote or give Jason a call on 0402 188238.
commented on "A large selection of Modern & Traditional Wing Chair styles are available at JARO Upholstery, Melb"
Ring or Text Jason today for an appointment to discuss your requirements. commented on "A sofa made up in Tasman Coronet Grey. Looks absolutely stunning!" 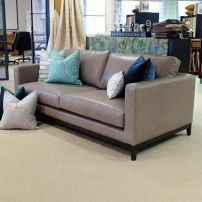 A sofa made up in Tasman Coronet Grey. Looks absolutely stunning! Available in a range of stunning colours. Make an appointment today to design your very own! 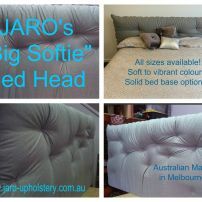 Simply contact Jason on 0402 188238 or email enquiries@jaro-upholstery.com.au.